Now let's create a dessert masterpiece for you! giving your guests lots of delicious flavor choices? A special custom design giving each guest their own little creation? mini cupcakie pies, cupcake truffles and cupcake parfaits? 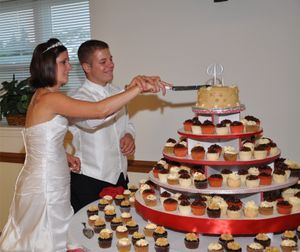 And for a traditional cake cutting ceremony, a complimenting 6" cake! Or if your are not into 'cake' how about Cookies, or Even Pies! We also offer you delivery and set up, if you choose. Call or email us and let's plan the perfect wonderful for the big day!